The Education Secretary Charles Clarke has set out how extra investment will be pumped into education. In the Budget debate on Thursday, he said the government was making a long-term commitment to education from the cradle to the grave. Mr Clarke was challenged by the Conservatives, who said the government was proposing to spend less on schools than the Conservatives would. Across the UK, funding for education is to rise to £77bn by 2007-08, up from £37bn in 1997 and £59bn this year. In England, spending per pupil will rise from an average £4,500 to £5,500, twice the 1997 figure. Overall capital investment in England willl rise from the £6bn promised already for next year to £8.1bn by 2008, again with similar announcements for the other home nations. Direct payments for head teachers to use on school priorities are to rise from £52,000 to £55,000 next year for a typical primary and from £165,000 to £180,000 for a typical secondary school. Higher education was promised a maintenance of real terms funding per head. The Education Secretary, is to designate up to 1,000 more specialist schools, alongside more City Academies. He told MPs: "The government is making a long-term deep commitment to deveoping education from the cradle to the grave, throughout life, in the belief that this is the way to economic strength for our country." "This settlement will enable schools to maintain this progress and continue with workforce reform and the recruitment of more teachers and teaching assistants. "And it will continue the drive to achieve excellence and to narrow the gaps in attainment between schools and between pupils within individual schools. " Mr Clarke said the settlement would enable primary schools to continue to raise standards of literacy and numeracy, supported by the recruitment of more teaching assistants. Conservative education spokesman Tim Collins told MPs there had been some "elements of progress" in education since 1997, but said the government had often just taken on Tory policies. The decision to cut the number of civil servants and spend the money on schools was a Conservative policy, he said, and City Academies had grown out of the the City Technology Colleges, pioneered by the Tories. "The government is embracing pre-existing Conservative polices," he said. For the Liberal Democrats, David Rendel, said: "We weclcome this as a good deal for the economy and the UK's education system." But he went on to criticise the government for dealing with funding for secondary schools separately from further and higher education. More 16-18 year olds were educated in colleges than schools, he said, yet the sector's funding needs had been "ignored" in the Budget. They needed a "cast iron guarantee of resources" he said. 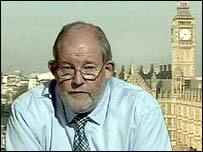 Charles Clarke goaded the Conservatives over their plans for "pupil passports" where funds would travel with pupils to the school of their family's choice. Earlier, the Shadow Education Secretary Tim Yeo had told MPs that this scheme could not be used as part payment of fees at independent schools. The Shadow Chancellor Oliver Letwin had previously been quoted as saying that they could. Mr Clarke told Tim Collins: "I have heard what you said today; what I am wondering is what will be the policy tomorrow and what is the Shadow Chancellor going to say tomorrow?" In reply, Tim Collins said: "The pupil passport will only be usable at state-funded schools providing education solely to those who pay for it with the passport. "It is a policy whose main purpose and greatest virtue is not to undermine publicly-provided education but for the first time to make publicly-provided education work for every part of our society not just for some." "Not one penny of subsidy will be available to those who send their children to fee-paying schools."